GLOBE Advisors readers will find of great interest this White Paper prepared by Betsy Dorn and Becky MacWhirte, and made available through the uspices of at call2recycle.org. As noted by the authors, behind the word “recycling” lie myriad issues that present an important challenge to organizations that have a stake in the responsible management of the end-of-life products. Carl Smith, president and CEO, Call2Recycle, Inc. notes that over the past decade, two broader materials management concepts have emerged that aim to change this. They represent a paradigm shift that challenges how we think about the products we create, how we use them and what we do with them when they’re no longer wanted. “From adopting different metrics to measuring the success of recycling programs to an increasing demand for tailored solutions, recycling should not be looked at in a vacuum but as part of a larger system where costs and the release of greenhouse gases and toxics, among others, inhabit. 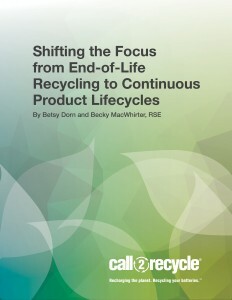 We recognize the challenges of the ever-changing dynamics surrounding product stewardship, and we’ve commissioned the White Paper entitled: Shifting the Focus from End-Of-Life Recycling to Continuous Product Lifecycles, with the interest of sharing the insights that stem from our 20 plus years of experience in battery stewardship”.